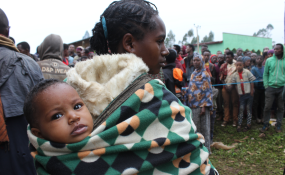 The number of people in need of humanitarian assistance in Ethiopia has spiked for the first time since it peaked following the 2015 El Nino drought. The figure, which had declined by eight percent in the previous year to 7.8 million people, has now increased to 8.3 million. Meeting this need will cost 1.3 billion dollars, according to the Ethiopia Humanitarian Response Plan for 2019, launched by the National Disaster Risk Management Commission and the United Nations Office for the Coordination of Humanitarian Affairs (UNOCHA). The budget for the response plan has been lowered by almost a quarter from the previous year. The current plan calls for 60pc of the budget to be covered by the Ethiopian government and 22pc by the World Food Program (WFP). "The rest will be covered by the international community," said Debebe Zewde, director of public relations at the National Disaster Risk Management Commission. Food assistance alone will take up 90pc of the budget. Close to 4.4 million people are targeted for nutritional support where more than 600,000 of the needy are children under five years of age. Another 2.7 million displaced people and returnees will benefit from emergency shelter and non-food assistance. The reason for the spike in the number of people in need of humanitarian assistance was not related to climate and natural hazards as has been the case in previous displacements. The nation topped the list of newly displaced people last year with 1.4 million people being uprooted from their homes. Among the worst affected areas by internal displacement due to conflicts are Gedeo and Guji zones in the SNNP and Oromia regional states. In April and June of 2018, over a million people were displaced in those areas. To date, around 600,000 people are still displaced from the area, according to sources close to the matter. Another badly affected area is the Kamashi zone in Benishangul Gumuz Regional State, with around quarter of a million people displaced. Of the more than eight million people that require assistance, 46pc are in the Oromia Regional State, and 22pc are in the Somali region. The Amhara and SNNP regional states take up 12pc and 10pc of the share, respectively. "The government is working on returning displaced people to their homes by ensuring their safety and security, providing platforms for people-to-people reconciliation and the necessary aid," said Debebe. "This will continue until the affected can get back up on their feet." Although preliminary studies have been done to assess the basic needs of the displaced people, a more thorough assessment needs to be done to properly identify what people in different parts of the country need, according to Adane Tesfaye (PhD), director of Institute of Disaster Risk Management & Food Security Studies at Bahir Dar University. "A thorough damage, loss and need assessment needs to be conducted so that the developmental support will not mismatch the need of a particular area," he told Fortune. "But while this survey is being done, the government should keep providing basic support to the affected areas." Communication between the public and agricultural, health and meteorological institutions and security forces need to be improved so that such natural and human-made disasters can be better dealt with in the future, Adane added.